Yellowfin is often marketed as ahi, from the Hawaiian ʻahi, a name also used there for the closely related bigeye tuna. The species name, albacares ("white meat") can also lead to confusion: in English, the albacore tuna (Thunnus alalunga) is a different species, while yellowfin is officially designated albacore in French and referred to as albacora by Portuguese fishermen. Yellowfin tuna are epipelagic fish that inhabit the mixed surface layer of the ocean above the thermocline. Sonic tracking has found that although yellowfin tuna, unlike the related bigeye tuna, mostly range in the top 100 m (330 ft) of the water column and penetrate the thermocline relatively infrequently, they are capable of diving to considerable depths. An individual tagged in the Indian Ocean with an archival tag spent 85% of its time in depths shallower than 75 m (246 ft), but was recorded as having made three dives to 578, 982, and 1,160 m (3,810 ft). Although mainly found in deep offshore waters, yellowfin tuna may approach shore when suitable conditions exist. Mid-ocean islands such as the Hawaiian archipelago, other island groups in the Western Pacific, Caribbean, and Maldives islands Indian Ocean, as well as the volcanic islands of the Atlantic such as Ascension Island and Saint Helena, often harbor yellowfin feeding on the baitfish these spots concentrate close to the shoreline. Yellowfin may venture well inshore of the continental shelf when water temperature and clarity are suitable and food is abundant. Yellowfin tuna often travel in schools with similarly sized companions. They sometimes school with other tuna species and mixed schools of small yellowfin, and skipjack tuna, in particular, are commonplace. They are often associated with various species of dolphins or porpoises, as well as with larger marine creatures such as whales and whale sharks. They also associate with drifting flotsam such as logs and pallets, and sonic tagging indicates some follow moving vessels. Hawaiian yellowfins associate with anchored fish aggregation devices and with certain sections of the 50-fathom curve. Yellowfin tuna prey include other fish, pelagic crustaceans, and squid. Like all tunas, their body shape is particularly adapted for speed, enabling them to pursue and capture fast-moving baitfish such as flying fish, sauries, and mackerel. Schooling species such as myctophids or lanternfish and similar pelagic driftfish, anchovies, and sardines are frequently taken. Large yellowfins prey on smaller members of the tuna family such as frigate mackerel and skipjack tuna. In turn, yellowfin are preyed upon when young by other pelagic hunters, including larger tuna, seabirds, and predatory fishes such as wahoo, shark, and billfish. Adults are threatened only by the largest and fastest hunters, such as toothed whales, particularly the false killer whale, pelagic sharks such as the mako and great white, large Atlantic blue marlin and Pacific blue marlin, and black marlin. The main source of mortality, however, is industrial tuna fisheries. Pole-and-line fishing is still carried out today in the Maldives, Ghana, the Canary Islands, Madeira, and the Azores. Few pole-and-line boats now specifically target yellowfin, an incidental take compared to the total commercial catch. In the Maldives, the catch is a mix of skipjack tuna and small yellowfins that often associate with them. Purse seining largely took over commercial tuna fisheries in the 1960s and 1970s. Today, purse seines account for more of the commercial catch than any other method. The purse-seine fishery primarily operates in the Pacific Ocean, in the historic tuna grounds of the San Diego tuna fleet in the eastern Pacific, and in the islands of the western Pacific, where many U.S. tuna canneries relocated in the 1980s, but significant purse-seine catches are also made in the Indian Ocean and in the tropical Atlantic Ocean, especially in the Gulf of Guinea by French and Spanish vessels. Purse seining for yellowfin tuna became highly controversial in the late 1970s when it became apparent that the eastern Pacific fishery was killing many spinner dolphins, pantropical spotted dolphins, and other cetaceans (often called " porpoises" by the tuna fleet) that accompany the fish. This association has been long-recognized by commercial tuna fishermen. Since the introduction of " dolphin-friendly" labeling, an increasing number of purse seine sets are now made on "free schools" unassociated with dolphins, as well as schools that associate with floating objects—another long-understood association that has grown in importance in tuna fisheries. The latter practice in particular has a major ecological impact because of the high proportion of bycatch, including manta rays, sea turtles, pelagic sharks, billfish, and other threatened marine species taken by setting nets around logs and other floating objects. Such tuna are often significantly smaller than the larger adult tuna associated with dolphins. The removal of huge numbers of juvenile yellowfin and bigeye tuna that have yet to reach breeding age has major potential consequences for tuna stocks worldwide. Most of the commercial catch is canned, but the sashimi marketplace adds significant demand for high-quality fish. This market is primarily supplied by industrial tuna longline vessels. Industrial longlining was primarily perfected by Japanese fishermen who expanded into new grounds in the Western Pacific, Indian, and Atlantic Oceans in the late 1950s and early 1960s. Longlining has since been adopted by other fishermen, most notably South Korea, Taiwan, and the United States. Tuna longlining targets larger sashimi-grade fish around 25 kg (55 lb) and up that swim deeper in the water column. In tropical and warm temperate areas, the more valuable bigeyes are often the main target, but significant effort is also directed towards larger yellowfins. Longlining seeks areas of higher ocean productivity indicated by temperature and chlorophyll fronts formed by upwellings, ocean current eddies, and major bathymetric features. Satellite imaging technology is the primary tool for locating these dynamic and constantly changing ocean areas. Bycatch is a major environmental issue in the longline fishery, especially impacting billfish, sea turtles, pelagic sharks, and seabirds. Besides the large-scale industrial purse seine and longline fisheries, yellowfin tuna also support smaller-scale artisanal fisheries that have often supplied local domestic markets for generations. Artisanal fisheries now also often fish for the lucrative sashimi market in many locations where international air shipment is possible. Artisanal fishermen tend to employ assorted hook-and-line gear such as trolling lines, surface and deep handlines, and longlines. 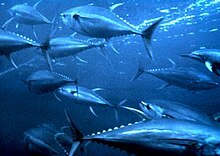 By far, the largest fishery using artisanal methods exists in Philippine and Indonesian waters where thousands of fishermen target yellowfin tuna around fish aggregation devices or payaos, although this fishery far exceeds the artisanal scale in terms of tonnage caught and the numbers of participants involved, and should more properly be considered a commercial handline fishery. General Santos City is the most important Philippine port for the landing and transhipment of catches. Catches that qualify as sashimi-grade are mostly shipped to the Japanese market; those that do not meet the grade are sold locally or canned. Elsewhere in the Pacific, small-boat fishers in Hawaii, Tahiti, and other Pacific islands supply local and in some cases foreign markets with fresh yellowfins. Handline-caught yellowfin tuna is one of the few exports of the economy of St. Helena. Yellowfin tuna probably first came to the attention of sports fishermen when they appeared on the tuna grounds of Catalina Island, California, only a few years after pioneering fishermen invented the sport, targeting the Pacific bluefin tuna. These tuna were of the same species caught by commercial fishermen in Japan and the western Pacific, but the reason for their appearance was not known at the time. Later, warmer water species such as yellowfin tuna, dorado and striped marlin were found to enter southern California waters in seasons having favorable ocean conditions, particularly during the El Niño phenomenon, which brings warmer water up North America's western coast. Yellowfin tuna were subsequently discovered by sport fishermen in Bermuda, the Bahamas, Hawaii, and many other parts of their range. Larger adult fish which had developed distinctively long sickle fins were initially thought to be a different species and were known as Allison tuna (a name first given by the then curator of the Bermuda Aquarium, Louis Mowbray, in 1920). Such destinations as Hawaii and Bermuda became famed for their catches of these beautiful fish. In Hawaii, various styles of feather lures served as bait, but in Bermuda, chumming techniques from boats anchored on productive banks were evolved to target not only Allison tuna, but also wahoo and the smaller blackfin tuna. Bermudian experts developed techniques to take all these fish on light tackle, and for many years the International Game Fish Association records for yellowfin tuna were dominated by entries from Bermuda in the lighter line classes, with fish in the 200 lb (91 kg) and larger class from Hawaii taking most of the heavier line-class records. Today, yellowfin tuna are a major sport fish pursued by sport fishermen in many parts of the world. Thousands of anglers fish for yellowfin tuna along the eastern seaboard of the United States, particularly in North Carolina and New England. Yellowfin are also a popular gamefish among anglers fishing from US Gulf Coast ports, San Diego, and other ports of southern California. Larger "long-range" boats in the San Diego fleet also fish in Mexican waters, searching for yellowfin tuna in many of the grounds that the San Diego pole-and-line tuna clippers used to fish. The yellowfin tuna is also a highly prized catch in the offshore sport fisheries of South Africa, Australia, and New Zealand. Sport fishing for yellowfin tuna exists on a smaller scale in many other parts of the world. According to the Hawaii Seafood Buyers Guide, yellowfin tuna is widely used in raw fish dishes, especially sashimi. This fish is also excellent for grilling. Yellowfin is often served seared rare. Yellowfin buyers recognize two grades, "sashimi grade" and "other", although variation in the quality of "other" grades occurs. Yellowfin is becoming a popular replacement for the severely depleted supplies of southern bluefin tuna. ^ Froese, Rainer and Pauly, Daniel, eds. (2018). "Thunnus albacares" in FishBase. February 2018 version. ^ a b Service, Shannon (2 April 2013). "The Saudi Arabia of Sashimi". Slate. Retrieved 2013-10-28. ^ "Pole Fishing for Tuna, 1937–1941 | San Diego History Center". Sandiegohistory.org. Retrieved 2012-03-22. ^ "The High Seas Tuna Fishery of California1". Content.cdlib.org. Retrieved 2012-03-22. ^ "2200T Super Tuna Purse Seiners". Cfsb.com.tw. Retrieved 2012-03-22. ^ "The Audubon Guide to Seafood". Spc.int. 2011-12-02. Archived from the original on March 19, 2007. Retrieved 2012-03-22. ^ "Greenpeace International Seafood Red list | Greenpeace International". Greenpeace.org. 2008-08-15. Retrieved 2013-10-28. Collete, B. (2011). "Thunnus albacares". IUCN Red List of Threatened Species. Version 2006. International Union for Conservation of Nature. Retrieved 22 November 2011. Listed as Near Threatened (v3.1). Froese, Rainer and Pauly, Daniel, eds. (2008). "Thunnus albacares" in FishBase. April 2008 version. Atlantic yellowfin tuna NOAA FishWatch. Retrieved 4 November 2012. Pacific yellowfin tuna NOAA FishWatch. Retrieved 4 November 2012.